While hardier than most flowers, fruits or vegetables, real Christmas trees are perishable. Proper care is important if you want to maintain the quality of your tree so that it lasts through the holiday season. Read below for tips on caring for your tree. Use a traditional reservoir stand. Make sure the tree has plenty of water. The stand should fit your tree. Give the tree a fresh cut. Make a fresh cut to remove about a 1/2-inch thick disk of wood from the base of the trunk before putting the tree in the stand. Make the cut perpendicular to the stem axis. Don't cut the trunk at an angle, or into a v-shape, which makes it far more difficult to hold the tree in the stand and also reduces the amount of water available to the tree. 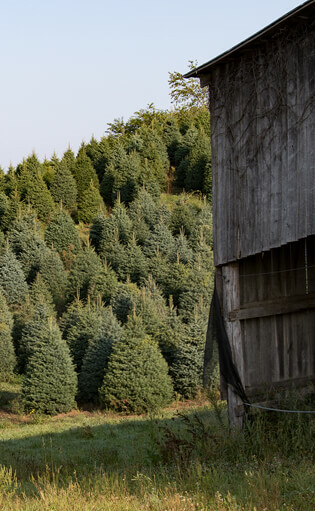 The farm, store, or lot where you purchase your tree might do this for you. Unless you have a stand that requires drilling, you do not need to drill a hole in the base of the trunk. Drilling a hole in the base of the trunk does not improve water uptake. Place the tree in water as soon as possible. Water temperature is not important. Use lights that produce low heat.